Now, yesterday we talked about having a blog as a presence and why you need one. Of course, that brings up the question of what is the difference between a blog and a website? Essentially a blog and a website are exactly the same thing. A blog is a website, however a website is not necessarily going to be a blog. Now the term blog comes from the word “weblog”. It was originally just a way of keeping a diary of sorts online. There have been diaries and scrapbooks developed online. Then people came along and developed blogging software which enabled you to put up the latest thing in chronological order, so that you can look up things in the archives, etc. Blogging sites that are out there and available are things like blogger.com (which is hosted by Google), and then there is WordPress.com. Both of those sites are free to use, however, I do not recommend anyone use those as part of their business. For your business, you want to use the selfhosted WordPress.org site. What that means is you hire a hosting company like Hostgator or others to host your site for you. I think it costs like $3 a month or something like that. By doing it this way, that puts you in control of your blog. There are others, but those are the two most popular ones out there for blogging. We should really abandon the term “blog”, because it makes your business sound cheap and nasty. The term blog makes you sound unimportant. Now, while you do own a blog (and sites like the New York Times runs on blogging software), what it is really becoming is a Content Management System. In the older days with one of my companies, when it first had its first website, we had a “latest news” section. Now, it went downhill, because once we got it, we could not keep it updated and then it just went static. We basically had 10 pages to use and once those 10 pages were used up, that was it. If we wanted to add new content, we had to write it up and send it to the web company. I had to pay like 50 pounds to add it, so we never did. We just could not afford those kind of updates. Back then, blogging software probably existed, but I had no way to really learn about it since it was a really long time ago. But now, we have the magic of WordPress. You can make your site look any way you want it to look. When I say “you”, I am talking about a designer. You need to make sure you are building your site on what is called a solid framework. The one we recommend is Genesis, which comes from Studiopress. There are others out there like Thesis and more, but we use Genesis and love it. Many people go to sites like ThemeFirst, which has loads of WordPress themes. Now, this site got hacked and a ton of code was injected into the site and a ton of themes were affected. That doesn’t really happen with Genesis, Thesis, and others and we’ve used them all. It is consistent so use it. It will work for your site. The other good thing about this is that they do update so WordPress continuously adds security updates. You can set it in the background so that your site automatically updates when they release a new security update. That means that they are generally mobile responsive, and that is another thing. If you have an old website, chances of it looking good on a mobile device are slim to none. You might think it looks exactly the same, but people have to stretch the screen to read it and it is tiny, etc. If your site is mobile friendly, there will be large gaps, and nice pictures and everything will be in balance. Because it will help you. There is nothing in it for me — I am just sharing this with you because I want you to succeed. Don’t get a static website. And don’t pay someone to do this for you. Do it yourself. If you pay someone to do it for you, they will have to do it all the time. You want to be able to update your own site when it needs it. Uploading to WordPress is no different that writing something in Microsoft Word. It codes itself. You just put it in, and it does the rest for you. 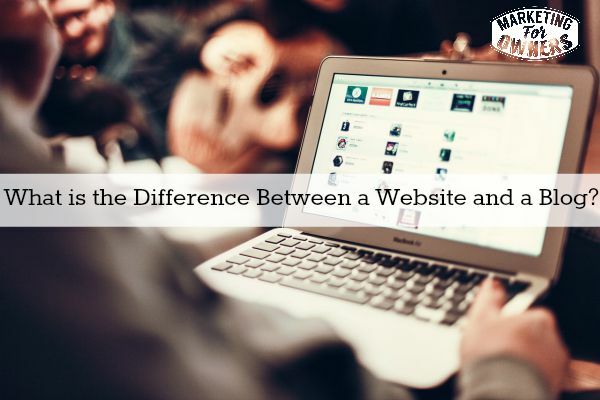 That’s the difference between a website and a blog. Today is Thursday and that means it is time for a podcast recommendation. Today I am going to share with you about ProBlogger. 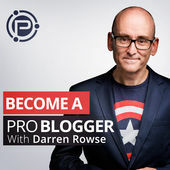 Now ProBlogger is run by Darren Rowse. He is from Australia. Darren is just brilliant. Now, he is late to the podcasting scene, however, his site, problogger.net is one of the most famous blogging sites out there. It is one of the original sites available. It gets like a million visitors a month. Now, his main love is Digital Photography School. This site gets like 7 million visitors per month, so it’s safe to say that Darren Rowse knows what he is doing. When he podcasts, he is going to teach you tons. I think he started off by going through his 31 days to become a better blogger series. Just look up ProBlogger and enjoy his podcast. You can learn a lot from him.